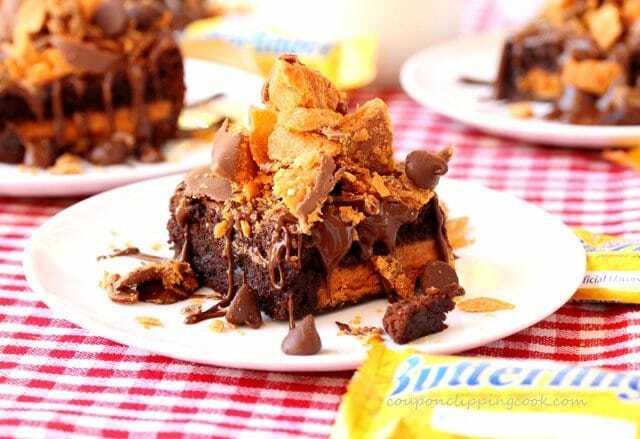 These moist double chocolate brownies with Butterfinger candy bars will cause a frenzy. It’s amazing how incredible brownies taste when considering it doesn’t take that many ingredients to make them. All that’s needed are basic things like flour, butter, eggs, sugar, milk and baking powder. And of course the star of the show, chocolate. That’s the only thing I normally need buy when I make brownies, the chocolate chips. For these yummies I added another ingredient, one of my faves, Butterfinger candy bars on the inside of the brownie as well as stacked on top of the brownie. Oh and then there’s the melted chocolate that’s drizzled on top of the brownie too. Whether these are made into Butterfinger brownie stacks, or served as a single brownie topped with candy bar chunks, there’s one thing for sure…they taste good…really good. Chocolate chips (milk chocolate and dark chocolate), butter, sugar, eggs, milk, baking powder, salt, flour and last but not least, mini Butterfinger candy bars. Plus an 8×8 square metal baking pan, and parchment paper. beat on high with a mixer until light and creamy. 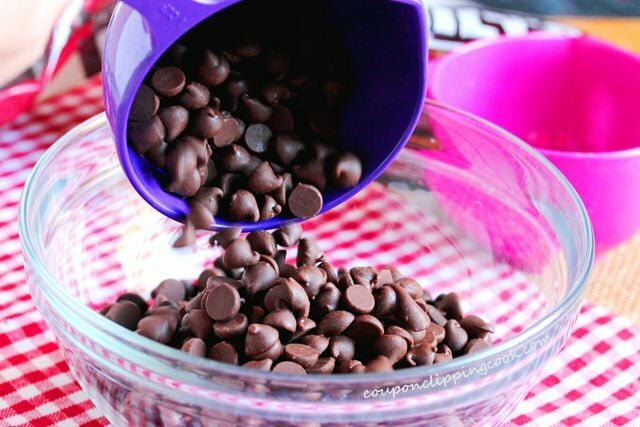 In a small microwave-safe bowl, add the chocolate chips. Heat the chocolate chips on the low setting for 30 second intervals while stirring in between. Just before they are completely melted (about two 30-second intervals, stir until smooth and creamy). 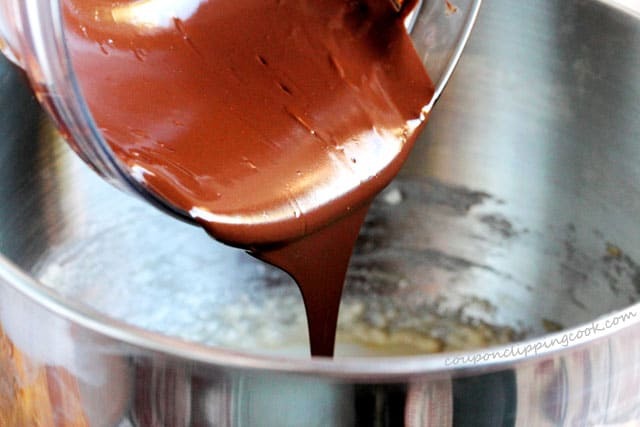 Let the melted chocolate sit for a few minutes so that it cools just a bit before adding it to the creamed butter mixture. 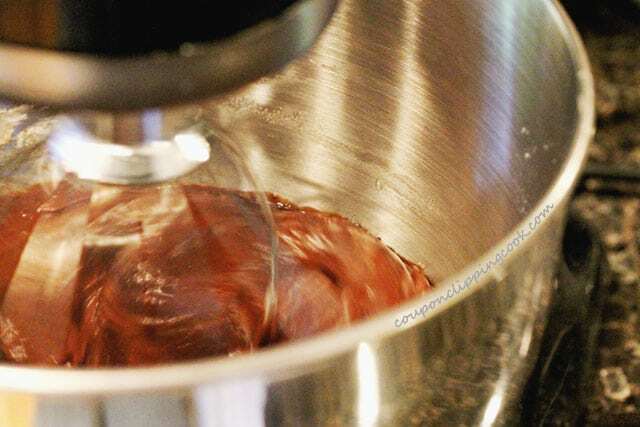 Pour the chocolate into the mixing bowl. Just a few more ingredients to add and the batter will be done. Beat on medium speed until incorporated. 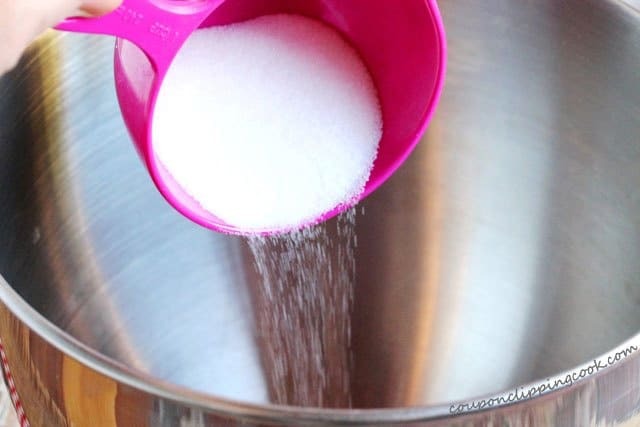 Add the flour and mix by hand with a spatula until incorporated. Set aside the batter for a moment. 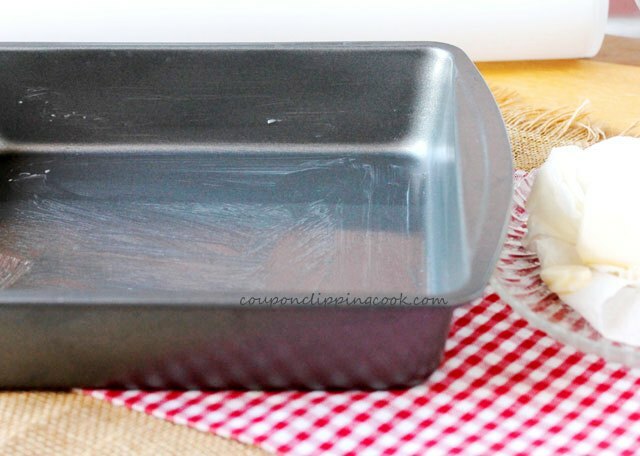 Grease the bottom and the sides of a square metal baking pan with butter. 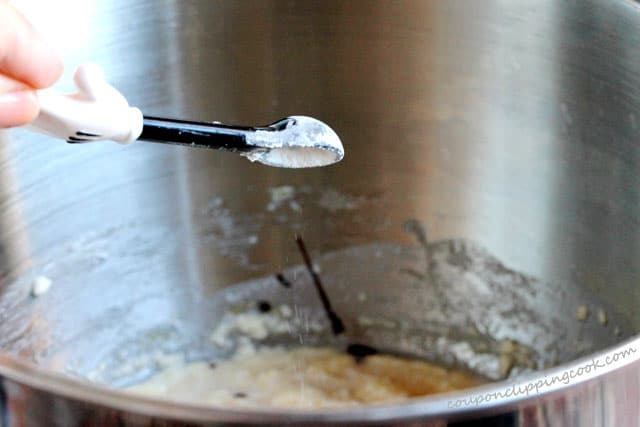 Line the pan with a piece of parchment paper with the edges (of the paper) extending out about 2 inches beyond the pan so that the paper can be used as a “sling” when removing the brownies after they’re baked. Make sure that all sides of the paper stick to the pan. If the paper isn’t sticking to a side of the pan just add a bit more butter to the pan. Then grease the bottom and sides of the parchment paper that’s in the pan with butter. Pour half of the brownie batter into the pan. With a spatula, smooth the batter so that it’s level. 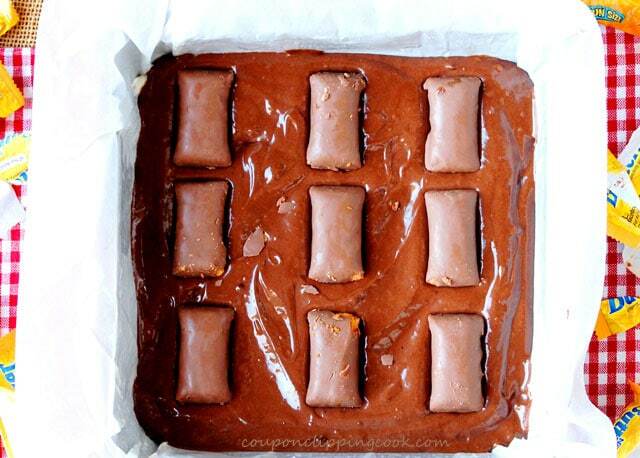 Lay 9 mini Butterfinger candy bars in the pan so that they are spaced out evenly. Top with the remaining batter so that the candy bars are completely covered. Smooth the batter again with a spatula so that it’s level. Bake in a preheated oven until the sides of the brownies start to pull away from the pan (about 25 minutes). Remove from the oven and set on a rack until completely cooled. 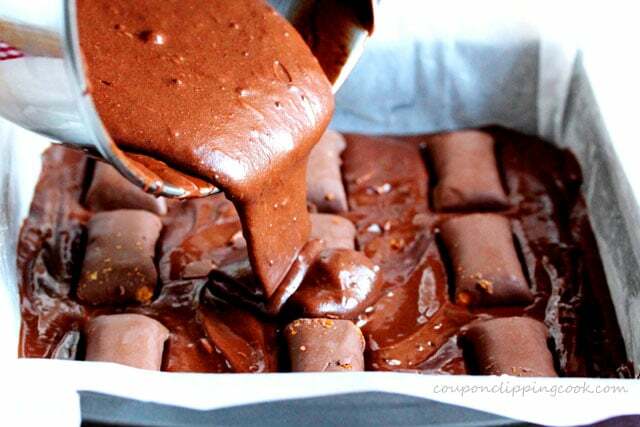 While the brownies are cooling, cut the mini Butterfinger candy bars into chunks and set aside. 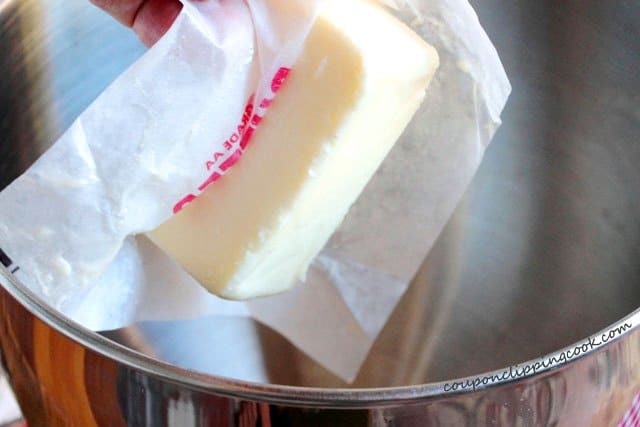 Once the brownies are completely cooled, grab ahold of the sides of the parchment paper, use them as a “sling” and lift the brownies out of the pan. Set the brownies (with the parchment paper still attached) on a large cutting board and cut them into serving sizes. 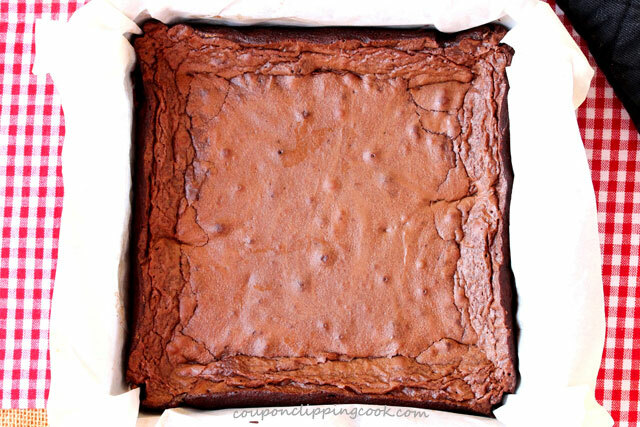 Place each brownie on fresh parchment paper. In a small bowl, melt more chocolate. 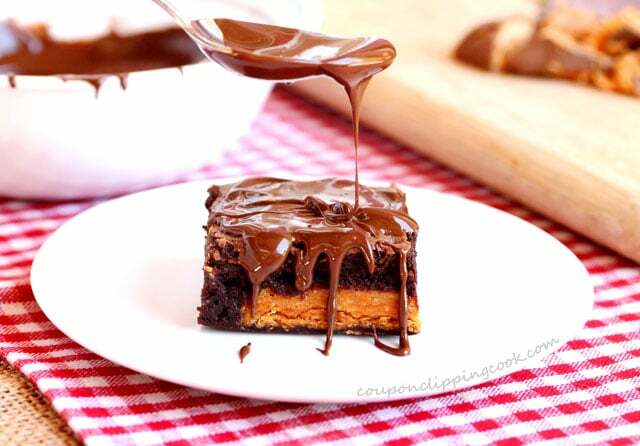 Drizzle chocolate on top of a brownie…. ….with some yummy drizzles down the sides. 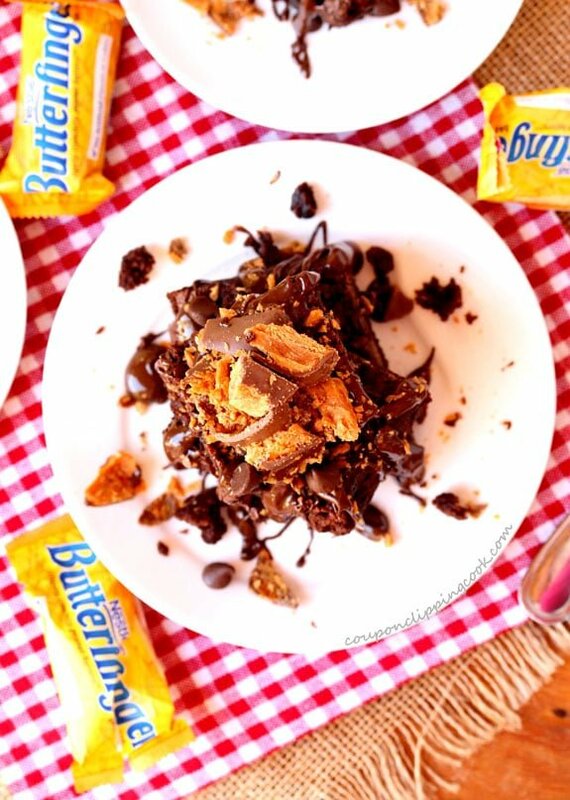 top with the chunks of Butterfinger candy bars. Just do this one at a time so that the chocolate doesn’t harden before adding the chunks of Butterfingers. And if you want, top with a few chocolate chips for good measure. 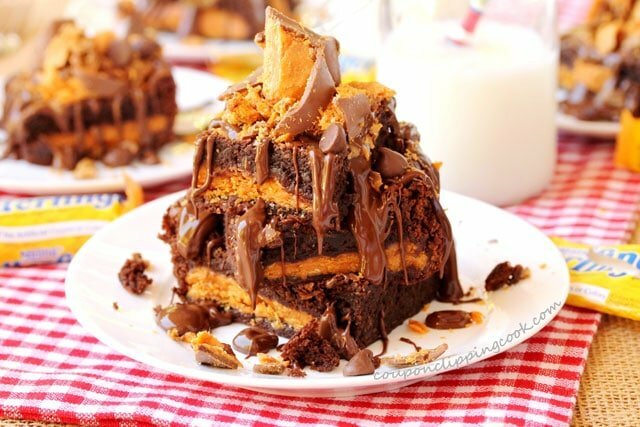 You can even make a Butterfinger brownie stack if you want. And then dig in to one of these chewy scrumptious brownies. Or even a stack of these chewy scrumptious brownies. 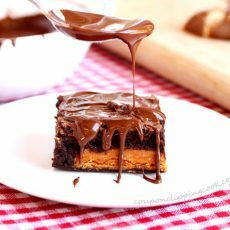 These moist double chocolate brownies with Butterfinger candy bars will cause a frenzy! Grease the bottom and sides of the metal baking pan (8-inches square). 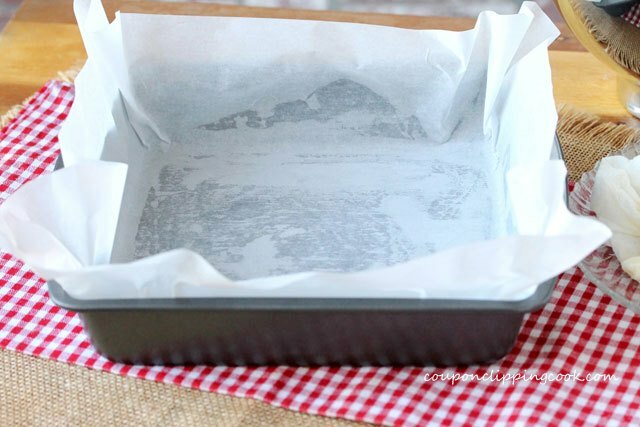 Lay a large square piece of parchment paper in the pan so that there is about 2 inches of paper extending over the edges to use as a “sling” when removing the brownies from the pan. Lightly press the paper to the bottom and sides of the pan so it sticks to the butter. Grease the paper that’s inside of the pan with butter. Set aside. 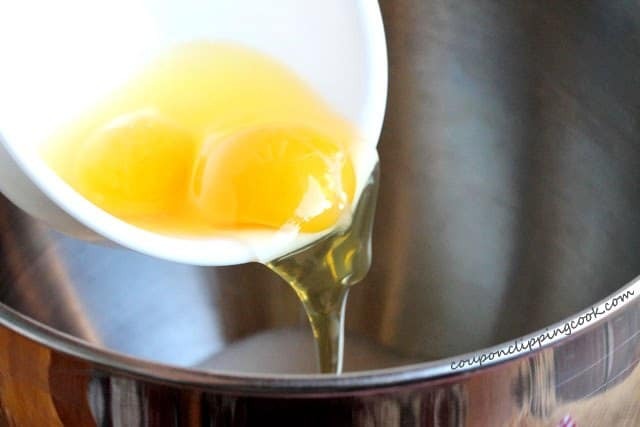 To a large mixing bowl, add the butter, sugar and eggs. Beat on high with a mixer until light and creamy. Add the milk, melted chocolate, baking powder and salt. Beat on medium speed until incorporated. 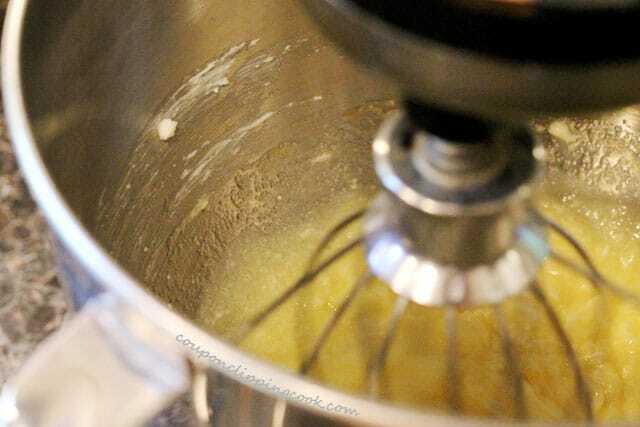 Using a large spatula, mix the flour by hand into the batter until incorporated. Pour half of the batter into the parchment paper lined-pan. 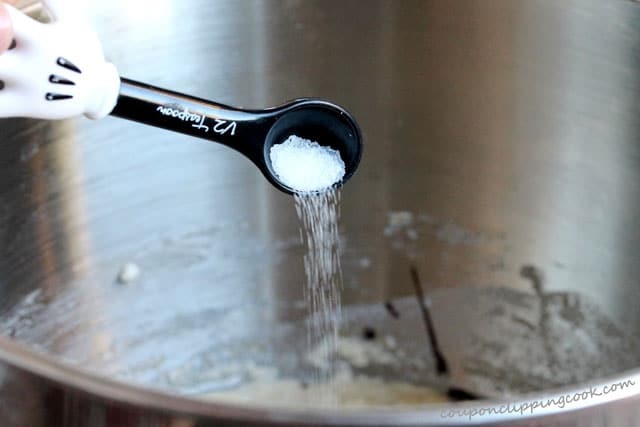 Use a spatula to smooth and level the batter. Lay 9 mini Butterfinger candy bars in the batter about 1 inch from the edges of the pan and equidistant from one another. Top with the remaining batter which should completely cover the candy bars. 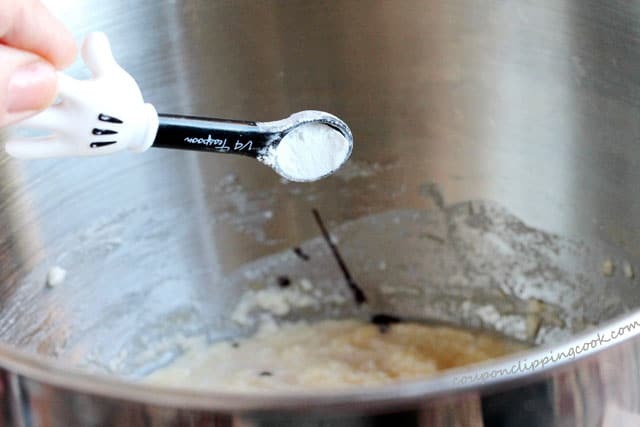 Use a spatula to smooth and level the batter. Bake in a preheated oven until the sides of the brownies start to pull away from the pan (about 25 minutes). Remove from the oven and let completely cool. 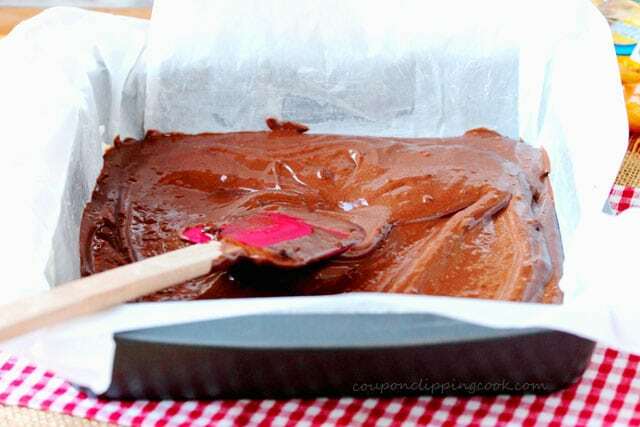 Lift the brownies out of the pan by using the parchment paper hanging off of the sides (the “sling”). Keep the brownies on the parchment paper and cut into serving sizes. Transfer the serving pieces on to a serving dish/serving dishes that are lined with fresh parchment paper. It’s best to serve the brownies on small pieces of parchment paper so they don’t stick to the plate. 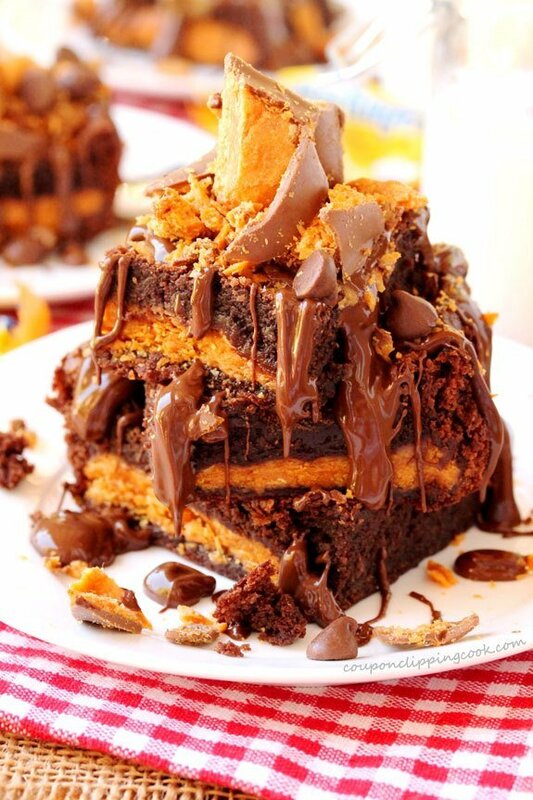 Drizzle melted chocolate on top of one of the brownies and top with chunks of Butterfinger candy. Do this one at a time so that the pieces of Butterfinger will stick to the chocolate before it hardens. Repeat the process with each brownie. Remelt the chocolate if needed. Um, holy drool. I seriously only thought stuff like this existed in my dreams… these look AMAZING! Hi Karly, thank you very much!